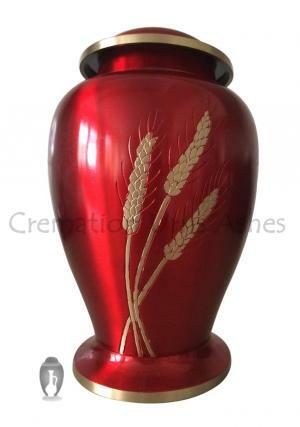 Low Price Large Dove Wheat Red Colour Adult Cremation Brass Urn for Ashes UK. » Large Human Cremation Brass Urn for Ashes. 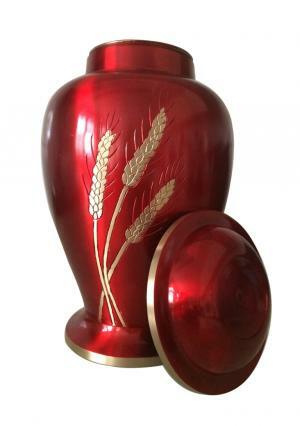 The beautiful wheat design on the Dove Wheat Urn is finished in polished brass, and set onto a background of deep red. The wheat symbol is ideal for both religious and secular memorial occasions and environments, as it refers to nourishment, growth, and cycles of rebirth. The Dove Wheat urn is hand cast form the highest quality brass, and its outstanding finish ensures that it will look beautiful for years to come. 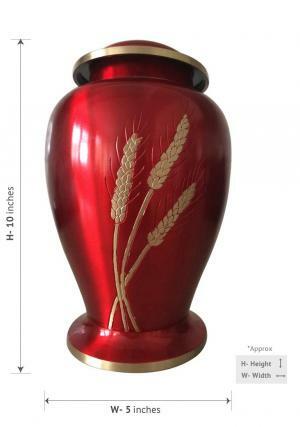 The wheat design is hand created and perfectly offset by touches of polished brass on the lid and foot of the urn. 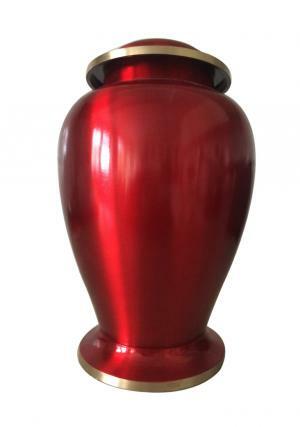 All of our large adult urns are available for personalisation. If you would like to add a personal message to your Dove Wheat Urn, please contact our friendly and helpful customer services department by emailing cs@cremationurnsashes.com; or by calling us on 020 8004 6667. 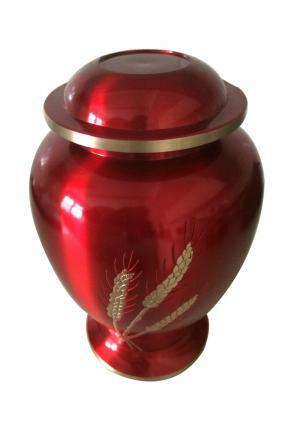 We also have personalized adult urn designs in which Dove wheat urn is one of the most beautiful. If you would like to discuss the perfect design for your loved one's final resting place, please contact us either using email or phone number. Our customer services team is discreet, respectful and knowledgeable, and will be more than happy to assist you in making the right decision. Postage is free on all of our large urns, to any address on the UK mainland. For non-UK addresses, again please contact us using the details listed here. We'll be able to give you a delivery price and time based on current charges. The Dove Wheat Urn weight around 2.3 kg unfilled. Big Human Cremation Urn is designed to take the full ashes of an adult. Please note that it may be paired with our Monarch Wheat Keepsake Urn.